Dining rooms are no longer average spaces that see little use in an interior. These rooms are the perfect place to make grand statements, and to bring home some over-the-top design ideas that will wow guests. Here are 25 dining rooms that will have you swooning. Los Angeles interior designer Kelly Wearstler is the woman behind this stunning dining room where it is clear that entertaining takes center stage. With a dining table that comfortably seats 20 guests, this dining room was made for social gatherings. Dining rooms are all about big statements and it's so important to frame the space. This dining area looks out from a large window. Flowing green drapery frames the space, and adds a pop of color to this neutral dining area. A dining room doesn't have to be limited to a formal space. It can be personal too. In this dining area, the walls have been painted a light blue for a chic, cozy atmosphere. A gallery wall has been placed bringing in lots of character. Seating is a mix of favorite chairs, and a striped rug adds to the personalization of the space. Small dining rooms can be a perfect opportunity for warm moments. Here, an area rug under the table warms this dining area. Above the table, lighting in rich metallic tones keeps things feeling cool. Modern dining rooms are taking on all shapes, sizes and even colors. No longer a plain white or lightly colored interior, some of the most stylish dining areas are dark and moody. This dining room in a soft matte black keeps things sophisticated and glamorous. The laid back color scheme allows the details to shine, from the sculpted mantel to the crystal pendant lights. In today's dining rooms, the chair game is real. To make your dining room stand out, look for chairs that truly make a statement. Here, a series of white chairs with a crisp black frame offers a cool contrast in this dining room. Don't forget - chairs make the room. Beyond drapery, there are other ways to frame the dining room in an interior. Interior designer Jessica Helgerson has created a unique frame in this dining room. The window trim has been painted a deep, dark black. The paint treatment creates an architectural detail that makes this elegant space stand out even more. Art in the dining room is the ultimate accessory. Gallery walls, large-scale pieces, custom designs are all welcome in the dining area. Not only does art help bring interest to dining room walls, but a great piece can be a conversation-starter when entertaining guests. Sometimes, just half a statement wall can do the trick. In this dining room, a wall acts as a divider between the dining room and living area. Painted a deep gray, the color creates a gorgeous statement wall, giving the dining room it's own environment, separate from the living area. Dining rooms are where design-lovers can have fun at home. It's also the place where some high-end ideas can be tried out and brought to life. This dining room brings high style with a stunning chandelier that is absolutely breathtaking. Beneath, it a Saarinen Tulip Table continues the wow factor. Yellow seating brings home the perfect pop of color, while dark walls add drama to this glamorous space. This dining room offers some great ways to get playful with color. Walls have been painted a deep eggplant. Around the large dining table, Eames chairs are playfully displayed in black on one side and white on the other. Topping off the dining room is a navy blue pendant that adds to the colorful mix. Beyond color, the absence of it can also be used to create a beautiful dining room, especially when bringing in a lot of layers. Layers of white take this dining room from stark to elegant. A cream rug, white dining chairs and an organic white chandelier all play well together in this sophisticated space. 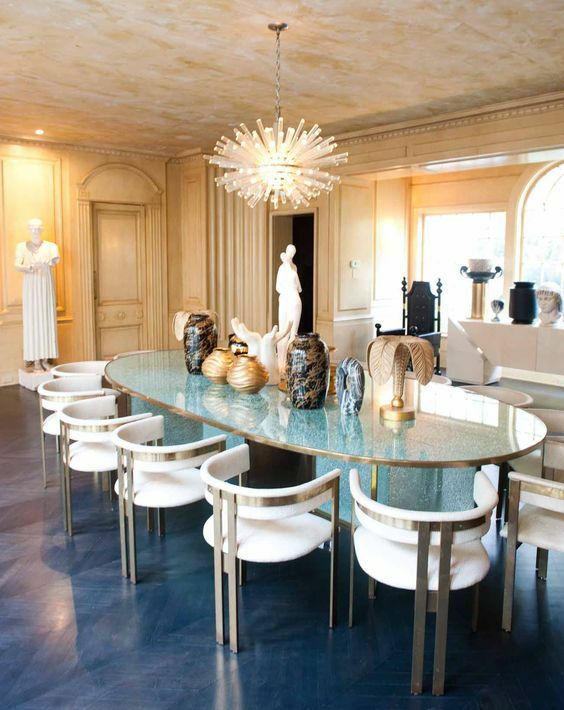 Spanish interior designer, Jaime Hayon, is the man behind this gorgeous blue dining room. A designer who has a masterful way with color, the blue walls, ceiling and velvet blue chairs are striking combination in this stunning dining area. Why should one style rule the dining room? In this dining area pale blue walls, woven lighting, a traditional table and modern rug all fit together seamlessly. The homeowner's collection of art also adds an unexpected vintage touch to the space. This beautiful dining room is dominated by color in all of the best ways. A dark blue wall draws you into the space. Colorful art in yellow and red finishes the room's bright wall story. And below, a rich gray rug adds a strong neutral to the space. Pale pink is eye-catching in this contemporary dining room. The whisper of color keeps things looking cool in a dining area where mid-century modern seating and an oversized table and lighting are the definition of luxury. There are so many ways to create a presence in the dining room. Sometimes a light fixture can do the trick, or a remarkable piece of furniture. In this dining room you have both. A starburst chandelier adds a sense of drama to this home's dining area. Below, the dining table is a one-of-a-kind piece. Bubblegum pink legs stand out as bright spots of color in this neutral dining area. Dining rooms can also be a place to play with cool contrast. In this dining room, black and white have been playfully combined. A white fish chandelier, a striking black table, and a black and white rug all come together to form the classic color palette. To break things up, mid-century modern chairs in a wood finish add warmth. In this dining room, just a few key pieces are used to create the look. A tulip table from the 1950s, classic white chairs and a starburst lamp complete the aesthetic. A large painting behind the table adds color and interest to the space. Greenery is Pantone's color of the year for 2017, and it's sparking a trend in green seating. In this dining room, velvet green dining chairs are the perfect way to bring a color splash home. Designer Jonathan Adler is the visionary behind this stunning vignette. Dark brown walls in a high gloss shine set the stage in this dining area. A large wood table seats a multitude of guests. Around it, blue velvet walls contribute a colorful dimension to the space. The dining room can express a specific vibe of the home. Here, this dining area is all about tropical style. From the leafy wallpaper on the wall, to the blue wishbone chairs, this dining room has been designed to transport guests to a far-off island. Above the table, ethereal modern lightings completes the look. For a traditional dining area, art on the wall can be a way to break up a stale aesthetic. Here, a gold leaf wall hanging adds a natural, sculptural element to the room. The touch of gold is absolutely stunning. Event the smallest of dining rooms can leave a big impact when designed beautifully. Woven wallpaper adds a tactile feel to this small dining area. For more texture, velvet seating with a touch of gold completes the glamorous look. Even though small, this dining room by designer Catherine Kwong is packed with style. This dining room, that easily seats eight, is perfect for family dinners. Emerald green chairs are the ultimate luxury. Above, a line of simple glowing pendants brightens the space. And classic architecture creates a beautiful frame to a luxurious dining space.